Star Wars 9 is continuing to shoot as we head towards the holidays, with breaks coming for Thanksgiving and Christmas. Quite a bit of the movie is already in the can, with even more footage to be shot into the New Year. Some of the scenes completed include Oscar Isaac as Poe Dameron and Carrie Fisher as General Leia. Only, the Leia scenes are being done without the presence of Carrie Fisher on set, who passed away in December 2016 just a few days after Christmas. Oscar Isaac is opening up about the experience of shooting Poe and Leia scenes alone. Poe shared most of his screen time with General Leia in The Last Jedi, when Luke's twin sister wasn't off recovering from her Mary Poppins flight through space. The recent comics have indicated that Leia's blast into the backend of the galaxy really wrecked her health, and the effects are suspected to bring about her untimely demise as a character. As most fans know by now, J.J. Abrams will be using discarded footage from The Force Awakens and The Last Jedi. While Carrie's own physical appearance won't be manipulated by a few finger strokes of the computer, it's sounding more and more like she will get a new digitally altered wardrobe, and it's possible that there will be some voice and mouth manipulation for newly created dialogue. That's all speculation at the moment. Some of the funnier forces online refer to the on-screen resurrection of Leia as J.J. Abrams' Plan 9 instead of Episode IX, because it mirrors Ed Wood's resurrection of Bela Lugosi in Plan 9 From outer Space, which utilized old film of the late actor to sell that cult classic sci-fi trash. Let's hope Episode 9 proves to be better than Plan 9. Because if it's not, this franchise really is in trouble. No story points for Star Wars 9 have been revealed at this time, though that hasn't stopped many from speculating about the plot, which will bring the Skywalker saga to a close after 9 movies and countless novels, comics, and a handful of animated TV shows. So it's not known exactly what General Leia will be doing in the movie. Asked about that aspect of the sequel, Oscar Isaac says that the movie handles Leia's story in, 'A really beautiful way'. And that the end of her story is, 'beautiful'. It also sounds like we're getting more Leia than expected. "The story deals with that quite a bit. It's a strange thing to be on the set and to be speaking of Leia and having Carrie not be around. There's definitely some pain in that." 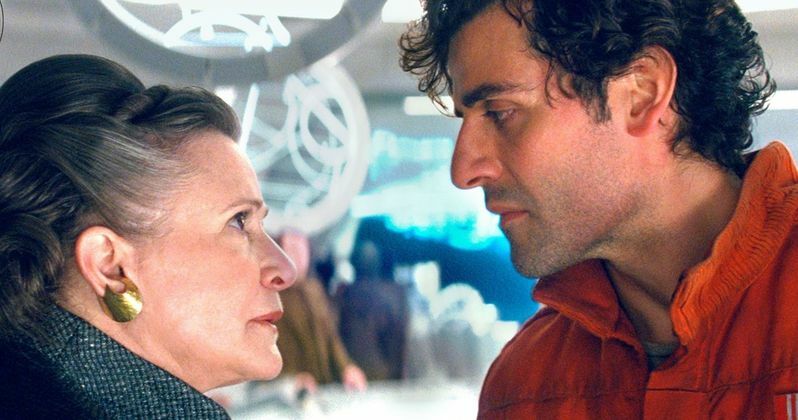 Oscar Isaac is quick to assure everyone that J.J. Abrams and his team will not disappoint fans with how they handle Leia's ultimate exit from the franchise. The actor goes onto say that having The Force Awakens director back in the captain's seat has allowed for things to be 'remarkably looser'. "Since everything just feels way looser and people aren't taking it quite as seriously. I think that that energy is gonna translate to a really great movie." After Star Wars 9 wraps, Oscar Isaac will be taking a year long break from acting. It has been rumored that the first Star Wars 9 trailer will drop during the Super Bowl, at which time J.J. Abrams should be done shooting and starting the post-production process for release that December. For those hoping to get their first look at Luke and Leia in the Super Bowl teaser, it's expected that neither will show up, with their big reveals being saved for the theater. We can, however, expect to see Poe Dameron back in action. These quotes were pulled from The Daily Beast.